The cost of ad impressions is determined in the course of the RTB auction based on the first and second price. If several bids that exceed or equal the CPM threshold participate in the RTB auction, then the winner is the advertiser who offers the highest bid. The impression price will equal that bid. 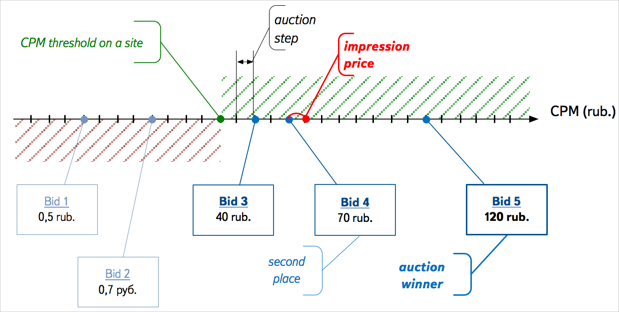 If a Yandex display advertising bid wins the RTB auction, then the advertiser's impression price is determined based on the strategy they chose. If only one bid is equal to or exceeds the CPM threshold in the RTB auction, then the impression price will equal the threshold. If several bids that exceed or equal the CPM threshold participate in the RTB auction, then the winner will pay the bid of their closest competitor + an auction step. For example, let's say the winning bid is 120 RUB/CPM (12 kopecks per impression), the bid of the closest competitor is 70 RUB/CPM (7 kopecks per impression), and the auction step is 1 RUB/CPM (0.1 kopecks per impression). In this case, the cost per impression will be 7.1 kopecks. The advertiser sets the cost of an impression in the interface and it will equal the value of the CPM parameter at the moment the impression displays (but can't be less than the threshold value). Attention. CPM values take effect within two hours after they are set or changed.